Sometimes, you don’t know what movie you want to watch. And you don’t have an easy way of sorting through all the different options available to you. That’s where FeelingReel comes in! FeelingReel is a project created by GroupMinded, a startup founded by more than 1,000 people (I’m one of them!). Instead of crowdsourcing the funding for the project, we crowdsource everything – every decision, every test, every idea – from naming to product development. FeelingReel is our first product to market, and I’d be lying if I told you that we weren’t thrilled to officially launch it to the public. Getting started is easy. Head on over to FeelingReel.com and sign up. Then you can start sorting through the countless available movies by mood, watching trailers, adding to your queue, eliminating those you have no interest in. It is a tool you can use to help you see through the clutter and find those movies you want to watch, when you want to watch them. Give it a try and let me know how it works for you. Thanks! Two years ago, I published my first book. 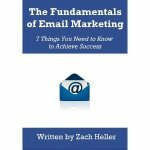 It was titled, The Fundamentals of Email Marketing: 7 Things You Need to Know to Achieve Success. And you can still purchase a copy here. Below are my top 10 fundamental tips for email marketers looking to avoid the spam folder, the "keys to the inbox" as I call them. 1. Avoid the word "Free" in the subject line. Spammers are always guaranteeing something for free, and email providers are looking for that term when determining whether or not to add your email to the user's inbox. 2. Limit the use of the word "Free" in the body of your email. Just like the subject line, the more times the word "Free" shows up in your content, the more likely that an email provider will assume you're spamming their users. 3. Avoid the use of dollar signs ($) in the subject line. Again, though it may seem like a great way to call attention to a deal or a discount, it's one of the first thing that email providers are looking for from spammers. Instead use a percentage discount, which can have the same impact without getting sucked into the spam trap. 4. Keep a clean list. This may seem simple, but it's important to make sure you don't continue to send to bad email addresses, or people who have unsubscribed. The more email addresses you send to who accept your emails, the higher your sender reputation. 5. Include a plain text version of your message. If you're sending out an HTML email, make sure that there is a plain text version as well, for those users who cannot see HTML on the device they are using to read email. Most email marketing services allow you to create one by copying the text from your HTML email. 6. Make sure there is a simple, and obvious opt-out or unsubscribe option. This makes it less likely that users will choose to mark your email as spam, and it's one of the things that email providers are looking for in your content. 7. Thoroughly proofread your email. Typos are a sure sign of a mass market spammer. 8. Check all of the links in each email that you send. Testing the links allows you to ensure that all links are correct and working. Broken links will frustrate users and will make it likely you'll get marked as a spammer. 9. Warn people that the emails are coming. Allow users to opt-in so that they know to expect emails and are more likely to accept them. You can also tell them the address that the emails are coming from so that they can add that email address to their contacts ahead of time. 10. It may sound overly simple, but make the emails worthy of reading. The more users on your list who are actually interested in your offer - or the content of your email - the more likely they will open it and click through it. This improves your reputation as a sender and sends a message to email providers that you deserve placement in the inbox. If you work at or run a small business, your time is limited. I know that. And that’s why you likely can’t get to everything on your marketing to do list. But I have a solution to your problem that will save you time and allow you to do more marketing in the year to come: Hire out your marketing work! Sure it costs money to hire a marketing agency, but the potential result is often worth the cost, especially for small businesses who are looking to grow. What can an agency help with? Usually operating on a percentage of money spent, or a flat commission, agencies will bring marketing expertise and manpower to companies who lack both. I’m in the business of giving away free advice. This blog should back that up. If you have a marketing question that you’d like me to answer, all you have to do is Ask Here! Every month I put out a free email newsletter to all of my newsletter subscribers, where I answer the key marketing questions that my readers ask. So ask away, and subscribe to the newsletter to see if I answer your question next month. It’s free advice, what more can you ask for?!? 2013 is shaping up to be a banner year for www.zachhellermarketing.com. We underwent our first major redesign and overhaul since our launch. Traffic is up 300% over last year, and subscribers have nearly doubled in the last six months. And we expect more of the same in 2014. With that, I wanted to let everyone know that our ad rates will be going up after the New Year. So if you’re interested in getting your brand in front of marketers and small business owners, now is your chance to lock in the current advertising rates for as long as you can. Anyone who books advertising between now and the end of the year will be grandfathered in to the current rates.